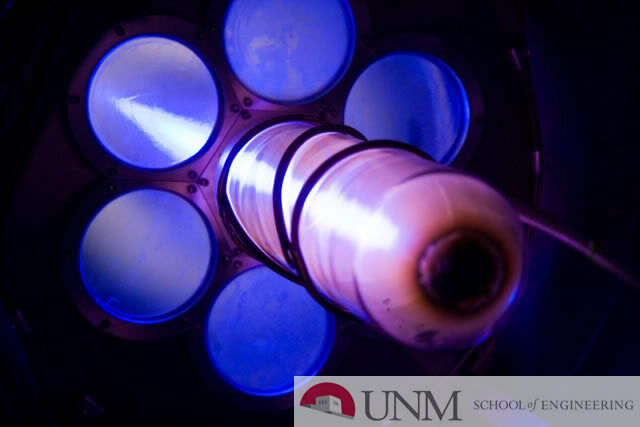 A pulsed gas, electrodeless discharge, plasma accelerator facility has been developed for experimental studies of the coupling mechanism for the transfer of energy from a driving magnetic field to a plasma. Gas at low pressure is ionized by an azimuthal electrical field induced through the action of a rapidly varying axial magnetic field produced by the flow of current through a ring surrounding a confining glass shock tube. The tube is arranged to permit radial expansion of the ionized gas. Due to its conductivity, the plasma, once it is formed, can exclude the rapidly varying driving magnetic field for a time. This field, in attempting to penetrate the plasma, induces current loops within the plasma; the loops, in turn, interact with the inducing magnetic field to produce a force that accelerates the plasma. This basic driving process is augmented by superposition of an externally developed, pulsed, magnetic bias (exciting) field whose period is many times longer than the driving period. The bias flux densities used were from one to two orders of magnitude smaller than the maximum driving flux densities.